Teeth whitening, which is one of the most common cosmetic dentistry procedures, is used to improve the beauty of your natural smile. It’s safe and provides fast results. Contact us today for more details. Teeth whitening is a great way to brighten up your smile and restore a youthful appearance. Over time, coffee, tea, tobacco, wine, foods, and medicines (tetracycline) can cause stains that result in our youthful white smiles fading to a darker yellow and less appealing smile. Teeth whitening always works. Everyone who elects to have this cosmetic dentistry procedure will see moderate to substantial improvements in the brightness and whiteness of their smile. It usually takes about two weeks to see the full results of whitening. This should be taken into consideration if you are whitening your teeth for s special occasion, such as your wedding or an important meeting. This whitening combination is by far the greatest technique for long-lasting teeth whitening. While the other techniques are effective, a whitening plateau is often reached if they’re performed alone. This combination method can break these plateaus and achieve an overall whiter smile. The process typically takes 2-4 weeks depending on the tooth whitening goals, the severity of the stains, and the severity of tooth sensitivity. Dr. Dan Rairigh will provide a treatment plan that best suits you and your budget. This is the best whitening option for long-lasting results. Custom trays are fabricated from dental impressions taken at your dentist’s office. Customized trays are then made from the models that allow for even distribution of gel and allow for less waste due to a precise fit. The great fit decreases the chances of gel burning your cheeks, lips, or gums. Various concentrations can be selected to fit the patient’s tooth whitening goals and sensitivity. The results are very good and take 1-4 weeks depending of the severity of tooth staining. This process is also called ZOOM!®and Sapphire&trade. At your dentist’s office, a protective barrier is placed over your gums and lips, and a tooth whitening agent is applied to the teeth and is activated by a whitening light. Typically, the process takes 1-2 hours. The results can be good and achieved in a very short time. 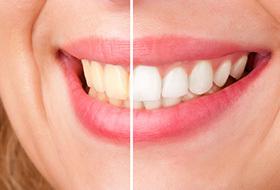 This whitening technique alone may not provide long-lasting results, though. This can include products such as Crest White Strips®. These products can slightly improve the brightness of teeth for younger patients or adults who only have slight staining. The concentration of whitening agent is often too low for more severe stains. This is the cheapest of the options. More Questions About Teeth Whitening? Contact us today by calling 412-854-2310 and find out more about services provided by Dr. Dan Rairigh’s office in the Pittsburgh area. Alternatively, you can let us know your schedule and simply request a cosmetic consultation. We offer 0% financing for teeth whitening procedures at our Pittsburgh office. Ask about our financing options and payment options for whitening when requesting an appointment.